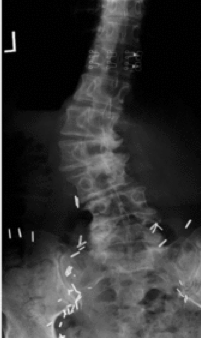 When an adult develops scoliosis, it is a completely different ballgame then an adolescent. 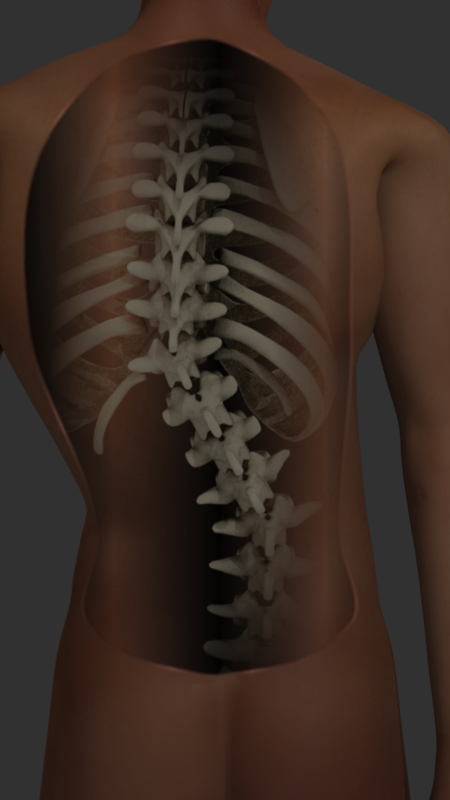 The spine is no longer flexible, so it does not respond to a spinal brace. In addition, arthritis is a large component of adult scoliosis, often resulting in significant pain and disability. Also a very different scenario then with adolescent scoliosis. Adult degenerative scoliosis typically starts with slow degeneration of the spinal disks. Over time, disks do not absorb stresses like they used to, thereby pushing them onto the joints of the spine. These facet joints experience accelerated arthritis, with patients ending up in significant back pain as a result. With the arthritis not being symmetrical, the person ends up with a significant curvature and scoliosis. This may cause someone to bend off to one side and possibly hunched forward, with difficulty seeing the world straight. Surgery for treating adult scoliosis is a long, complicated ordeal, with rehabilitation often extending 6 to 12 months. Complication rates exceed 60%, with anything resulting from mild issues like constipation to severe issues such as a bad nerve injury. The decision should not be taken lightly, and surgery can often be avoided with modern Seattle pain management techniques. The top pain management clinics in Seattle offer several conservative, nonsurgical options for relief of adult scoliosis. The first option is medication management. This may include anti-inflammatories, Tylenol and occasional narcotics. For times when the person is having an exacerbation of the pain, short-term narcotics can be extremely beneficial. Another nonoperative option for pain relief involves injections. This may include trigger point injections to relieve muscle spasms and aching, or facet blocks to relieve pain from the spinal arthritis. These injections can relieve pain for months at a time, and be placed into multiple arthritic joints. That is one of the biggest issues with the gender of scoliosis, that multiple levels are involved with the breakdown and pain. Another procedure that is often utilized for patients suffering pain from adult scoliosis is a radiofrequency ablation. Spinal joints need a nerve supply for sensation. Blocking that nerve supply with the radiofrequency ablation will deaden those nerves for up to 24 months. The RFA procedure is outpatient, low risk and effective for over 80% of patients. The procedure may be performed on several spinal joints at one time, with a repeat procedure typically producing the same amount of relief when it becomes necessary. Surgery for adult scoliosis is typically a long procedure that is often performed on staged procedures over a period of 3 to 7 days. Adults often do not tolerate the lengthy procedures, blood loss and fluid shifts that occur. Therefore it is in the patient’s best interest to try and avoid the procedure if at all possible. For the top Seattle pain management, call Seattle Pain Relief today at (855) WASH-PAIN. The board-certified physicians offer all of these treatments for exceptional success rates for those dealing with degenerative scoliosis.